They are known in Japan as Doubutsu Doonatsu which literally means Animal Doughnuts. Aren't they just too cute to eat? They are priced slightly higher than normal doughnuts as each doughnut requires a lot of icing and a lot of time to draw their faces. This 1/6 scale version is no bigger than a penny! So far I have created 13 new and unique designs. As usual, you can choose a design here or a custom design of your choice. Animal Doughnut parade! 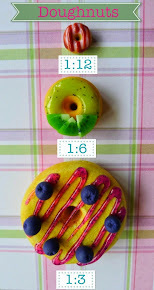 Each fluffy doughnut is coated with a thick layer of sugar icing and individually decorated. The face is the toughest part to draw. Our next new item is a cupcake variant now available in the Cupcakes menu. It is made from 6 layers of creamy rainbow frosting and topped with a cherry. Another new item is a variant of our popular French macarons. These are heart shaped and slightly bigger than a standard macaron and filled with whipped cream. Now available in the French Pastries menu. The final new arrival in the shop is a 1/3 scale Bubble tea. Bubble tea is a popular milk tea drink with 'pearls' from Taiwan. Our Littlest Sweet Shop variant includes whipped cream to make it even more rich and lush! My facebook fans were given a preview of the new Doubutsu Doonatsu a week ago and many Littlest Sweet Shoppers were already interested in commissioning them! I made 2 of these into earrings for a special commission. In other news - MY FIRST BOOK CREDIT! I made non-food (and some food) miniatures for this book that is available in all major bookstores. You can find it here on Amazon. 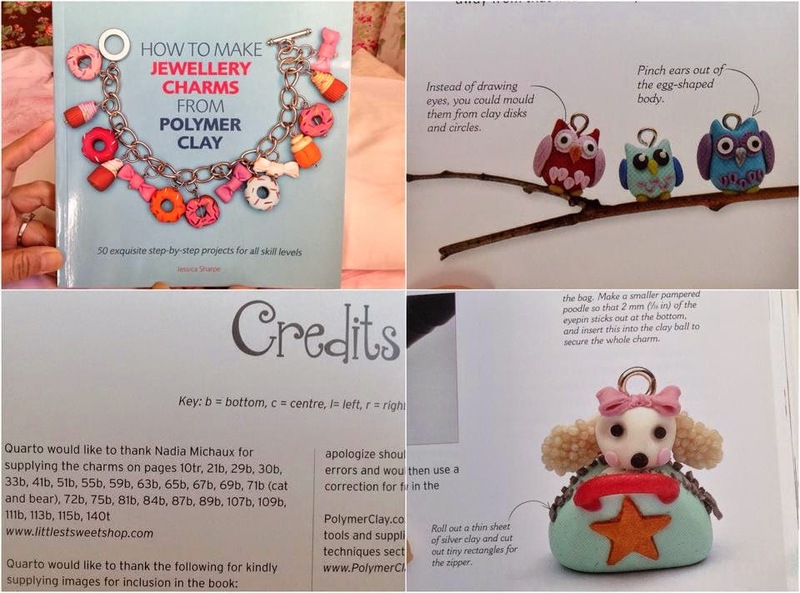 The book shows you how to make 50 polymer clay charms which are no bigger than 2cm tall which you can use for almost anything! I made a few charm variants with explanations on how to make them. Here are a few screenshots of the charms I made for the book and my credit that you will find on the last page. Ok. That's all for today. Make sure you visit Littlest Sweet Shop for all your doll's sweets and treats. Dolly tea parties will never be the same again!